Nisbets originated from humble beginnings when Andrew Nisbet started his own business selling knives, clothing and textbooks to catering students, back in 1983. The brand is now a global enterprise, though it keeps its headquarters in Bristol, where Andrew started out. You’ll find UK offices and stores in Aberdeen, Bristol, Cambridge, Chelmsford, Chester, Edinburgh, Kingston, Leicester, Liverpool, York, Belfast, Reading, London and Manchester. Nisbets also has stores and headquarters in Europe and Australia, in over 100 countries worldwide. Nisbets has over 500,000 customers worldwide now, ranging from hotel chains, to cookery schools and high-end restaurants. Nisbets sells everything you could possibly need to fit out a professional kitchen, or a home kitchen. Product ranges include: knives, chef whites, crockery, cutlery, bar supplies and tableware. 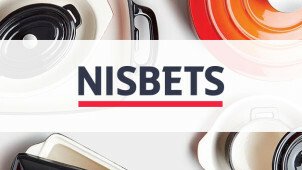 If you’re serious about cooking, or have just opened a new cafe - we’d strongly recommend you pick up a Nisbets catalogue, or start browsing the Nisbets website for ideas and products to stock up your catering department with. How do I use my Nisbets discount code? Sign up to the newsletter and be the first to hear about special offers and new product ranges. Does Nisbets offer a price match? Yes, it’s called the Price Match Promise, and if you find a lower published price for a like for like product, on the same terms, Nisbets will beat it by 5%. Simply complete the online form and a member of the Nisbets team will get back to you. Does Nisbets offer an installation service? Yes, a few Nisbets products require specialist installation by a qualified tradesman. Nisbets offers a product installation service using experienced specialist installation engineers to ensure installs comply fully with manufacturer requirements. Call 0845 111 0538 to arrange your installation. Does Nisbets offer gift vouchers? Yes, gift vouchers are available to buy and redeem in store, online or over the phone. Your recipient has a choice of over 20,000 products, and vouchers are available in £5, £10, £20 and £50 denominations. Delivery is usually made the next day if you order before 8 pm. Orders placed on a Friday will usually be delivered on the following Monday, unless a premium Saturday delivery service has been requested. Orders placed on a weekend, up until 3pm on Sunday, will usually be delivered on the following Monday. For more info, go to the Delivery & Returns page. Nisbets offers a 30 day money back guarantee, and a free return. You can exchange the item or request a full refund. Simply call or email customer services to arrange your collection. Go to individual store pages via the Store Checker page to find out the opening times. Nisbets is an international catering brand selling products and services to professional companies as well as the general public. Use a Nisbets discount code to kit out a new kitchen with some cut-price crockery, furniture and catering appliances. You can order a catalogue and phone in an order or do all your shopping online. Nisbets catering supplies stores can be found all round the UK, so if you’d prefer to see things in the flesh, find your nearest store today! NIC (Nisbets in the Community) is all about Nisbets giving back to the community. Nisbets has been recognised and awarded by Bristol City Council, for the work it has done enabling others to fulfil their potential in employment, skills and learning. As well as helping talented people into employment, Nisbets also supports local and national charities including Children in Need, St Peters Hospice, Cots for Tots and Caring at Christmas to name a few. Nisbets employees regularly get involved in charitable activities such as volunteering, running 10k races and dress down days charity collections. Are your chef whites not looking so white any more? Why not use a Nisbets voucher code to purchase some gleaming new kitchen clothes, aprons and shoes. You’ll be proud to wear this extensive range of professional quality items from top brands such as Chefworks, Whites, Birkenstock and Crocs. This selection of catering uniforms for kitchen staff and front of house include chefs jackets, tunics, chef trousers and headwear, and even a range of childrens clothing.